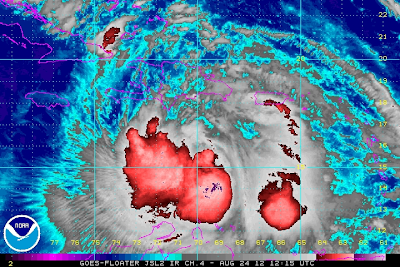 Tropical Storm Issac Has Strengthened Somewhat This Morning. T.S. 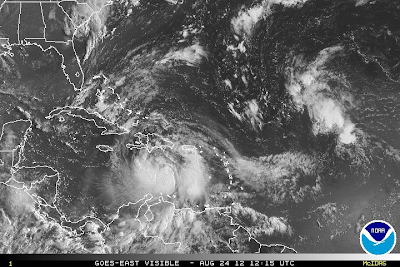 Issac Satellite Images At 6:15 AM MDT. T.S. 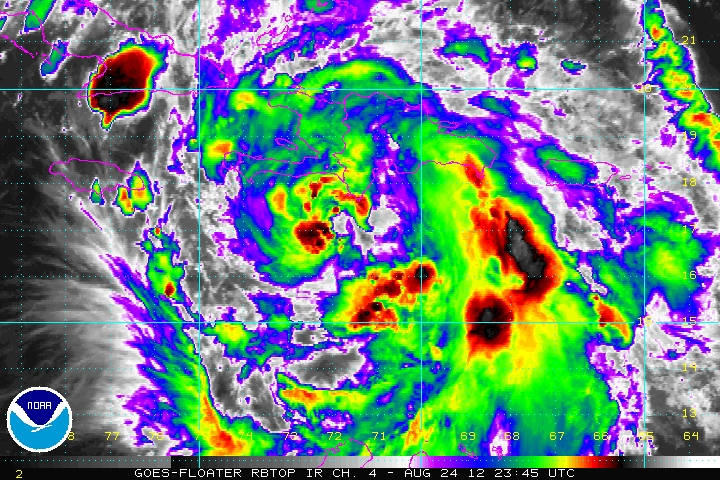 Issac IR RBTOP Satellite Image At 5:45 PM MDT. 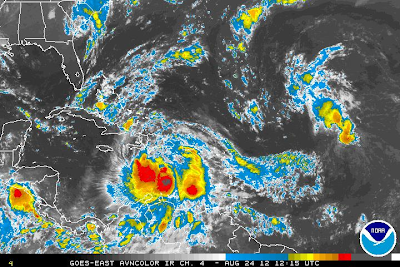 As of 6 PM MDT, Tropical Storm Issac was located about 90 miles south-southeast of Port Au Prince, Haiti. Issac has slowed down in his forward speed, now moving to the northwest at 10 mph. Issac has sustained winds of 65 mph with gusts near 75 mph. His central pressure continues to fall slowly, now down to 29.29 inches of mercury, or 992 millibars. Issac is forecast to make landfall over Haiti tonight, and may weaken when doing so. 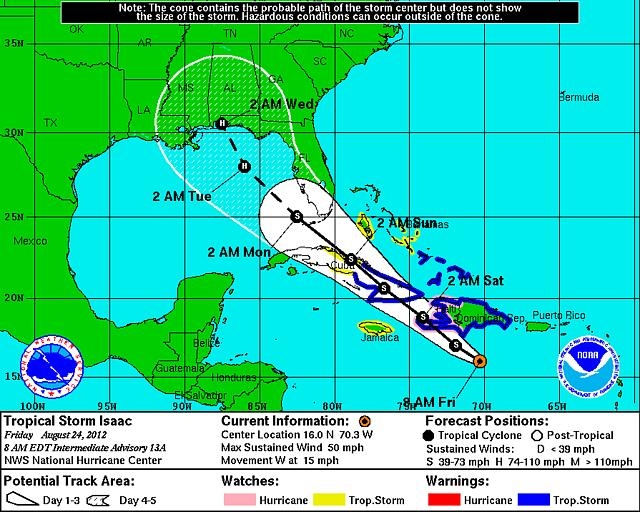 Issac is forecast to move over or near southeastern Cuba on Saturday, and over central Cuba Saturday night. 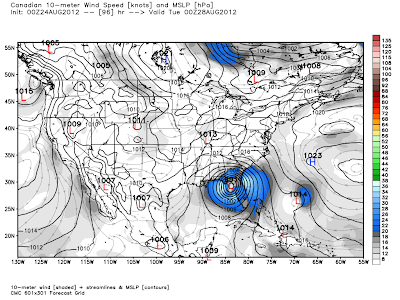 By Sunday Tropical Storm Issac is currently forecast to be approaching the Florida Keys. 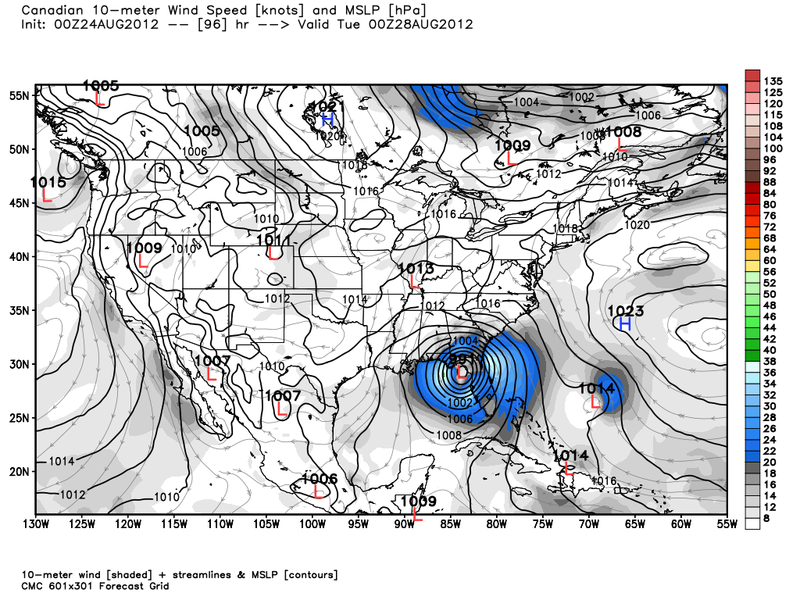 Once he enters the Gulf of Mexico by Monday he is forecast to strengthen into a Hurricane. As of Noon MDT, Tropical Storm Issac was located about 135 miles south-southeast of Port Au Prince, Haiti. 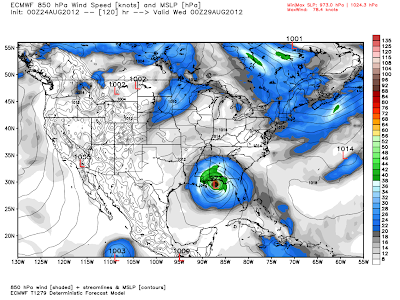 Issac still has sustained winds of 60 mph with gusts near 70 mph. His central pressure is dropping slowly, and is down to 997 millibars, or 29.44 inches of mercury. Issac has turned towards the northwest with a forward speed of 14 mph. Issac is forecast to make landfall along the southern coast of Hispaniola this afternoon, pass over or near Haiti tonight, and then over or near eastern/central Cuba Saturday into Sunday. Some additional strengthening is possible before he makes landfall along the coast of Hispaniola by tonight, and he could reach Hurricane strength by landfall. 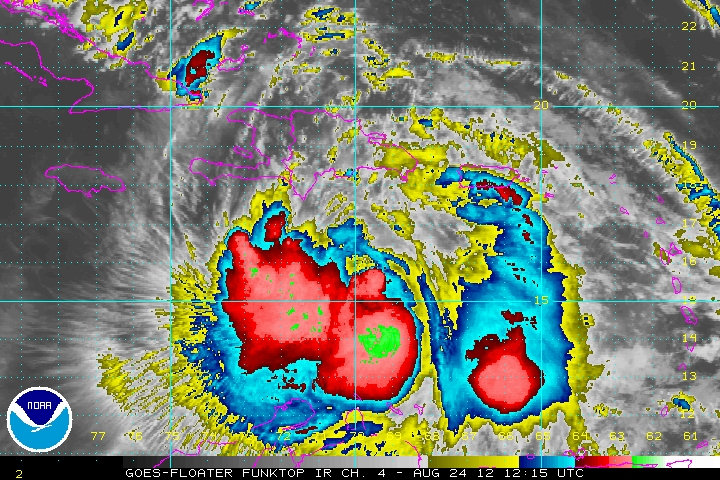 As of 9 AM MDT, Tropical Storm Issac was located about 185 miles south-southeast of Port Au Prince, Haiti. Issac has strengthened a little more, and has become a little better organized since the 6 AM MDT advisory. 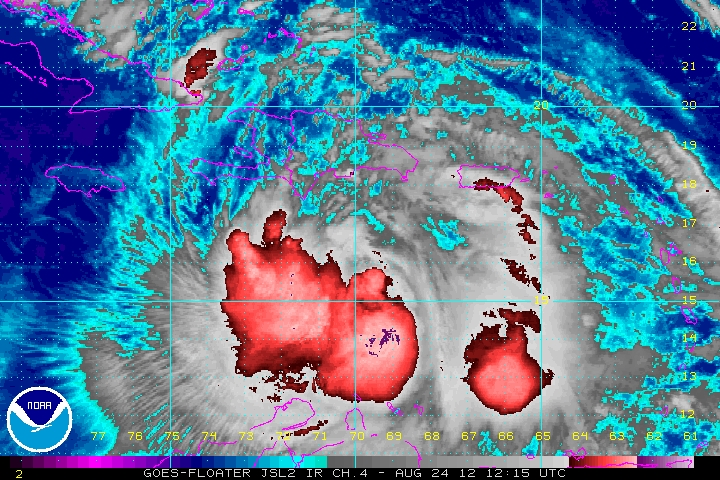 Issac now has sustained winds of 60 mph with gusts near 70 mph. His central pressure remains steady at 1000 millibars, or 29.53 inches of mercury. 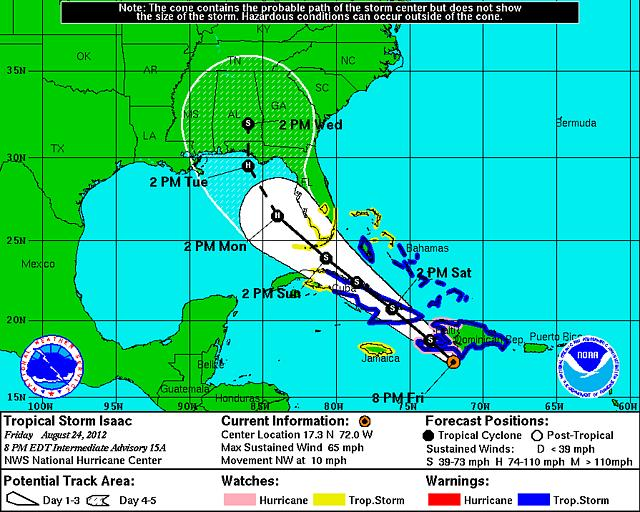 Issac's forward motion remains somewhat uncertain, but the official track is to the west-northwest at 14 mph. It should be noted that after 72 hours from now, the European forecast model (ECMWF), is forecasting more of a ridge between Issac and the trough of low pressure to the north of Issac, which would cause the storm to track more to the northwest through day five. The GFS forecast model on the other hand, is forecasting a stronger trough of low pressure to the north of the storm, which would cause Issac to get pulled further to the north through day five. Tropical Storm Issac has had a rather difficult time organizing itself the past couple of days. 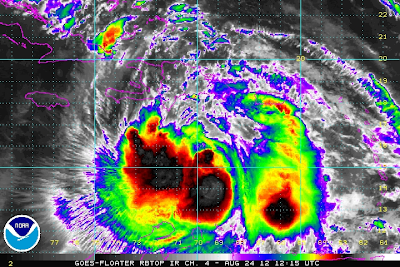 He continues to be a large cyclone, stretching 1,000 miles across. Issac has had a broad and somewhat disorganized central circulation, with multiple vorticity centers over the past couple of days. 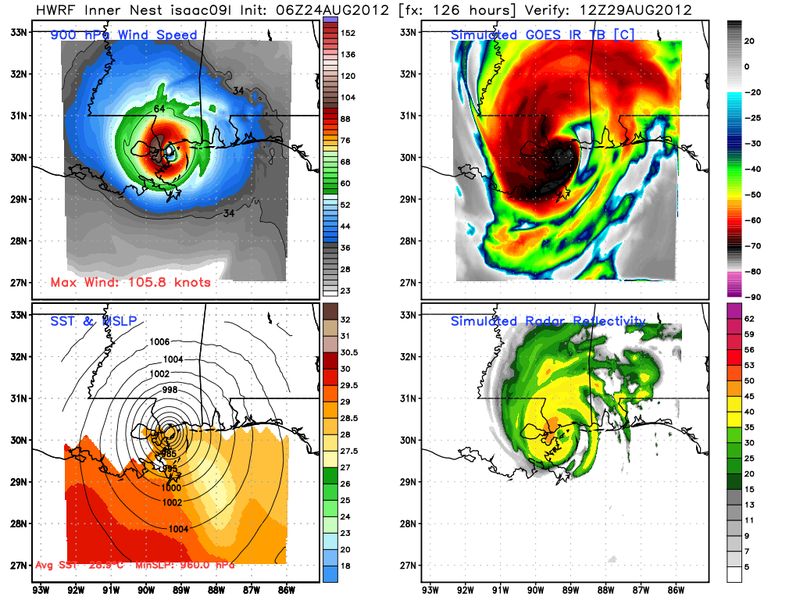 However, as of the 6 AM MDT update this morning, Issac has under gone some strengthening. This may be short lived since the cyclone is forecast to mover near or over Hispaniola today, and near or over southeastern Cuba on Saturday. If this occurs the mountainous terrain of these island nations will tear Issac's low-level circulation apart, and hinder any further strengthening of the storm. Tropical Storm Issac had a sustained winds of 50 mph with gusts near 60 mph, his central pressure had dropped down to 29.53 inches of mercury, or 1000 millibars. Issac's forward movement has been somewhat difficult to determine at times, but the general consensus is that he is moving to the west at 15 mph this morning. Issac is forecast to produce as much as 8" - 12" of rain over Hispaniola, with perhaps as much as 20" in some spots. This will lead to life threatening mud slides and flash flooding. NHC Forecast Track As Of 6 AM MDT. NHC Forecast Track As Of 9 AM MDT. NHC Forecast Track As Of 6 PM MDT. Forecast Track Of T.S. Issac. 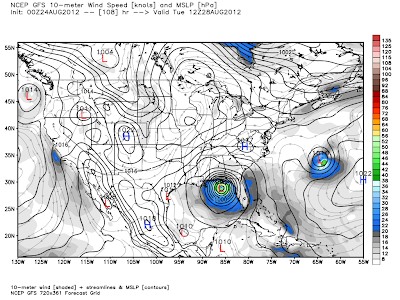 Valid At 6 AM MDT Tuesday Aug 28, 2012. 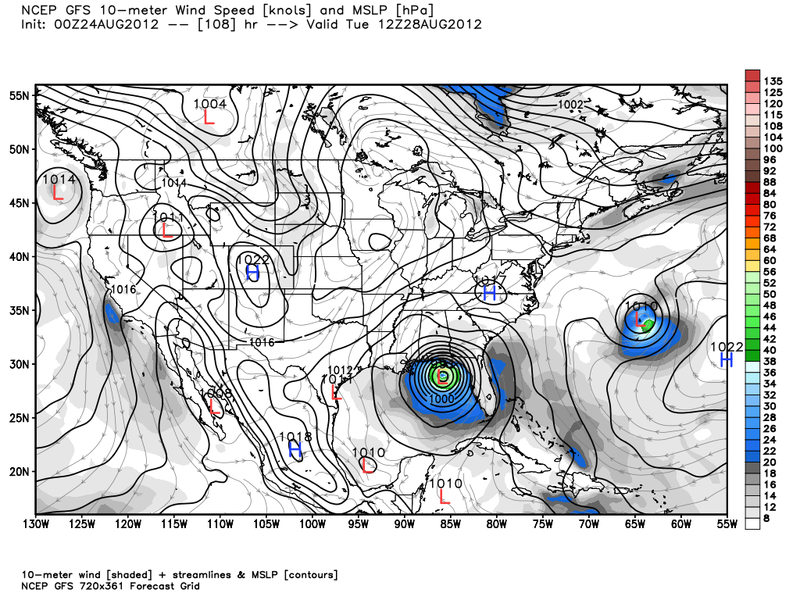 00Z/6 PM MDT CMC Forecast. 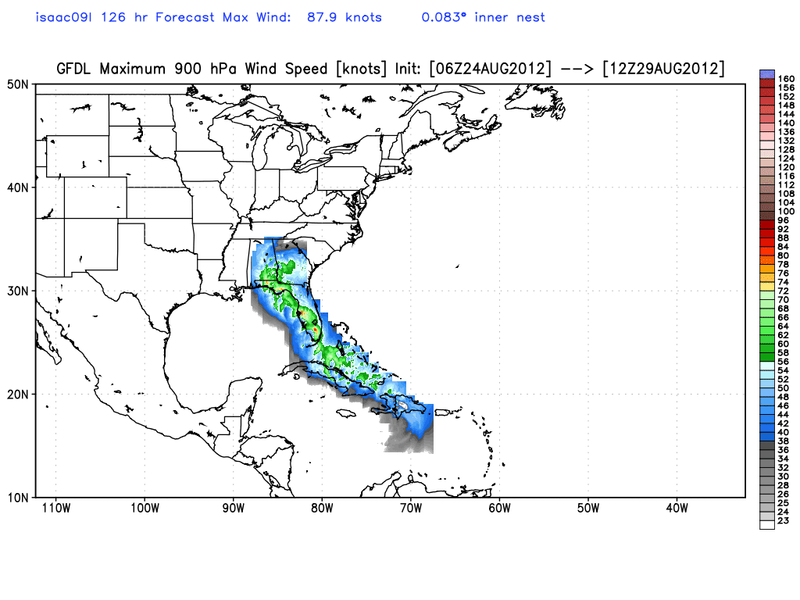 00Z/6 PM MDT ECMWF Forecast. Valid At 6 PM MDT Tuesday Aug 28, 2012. 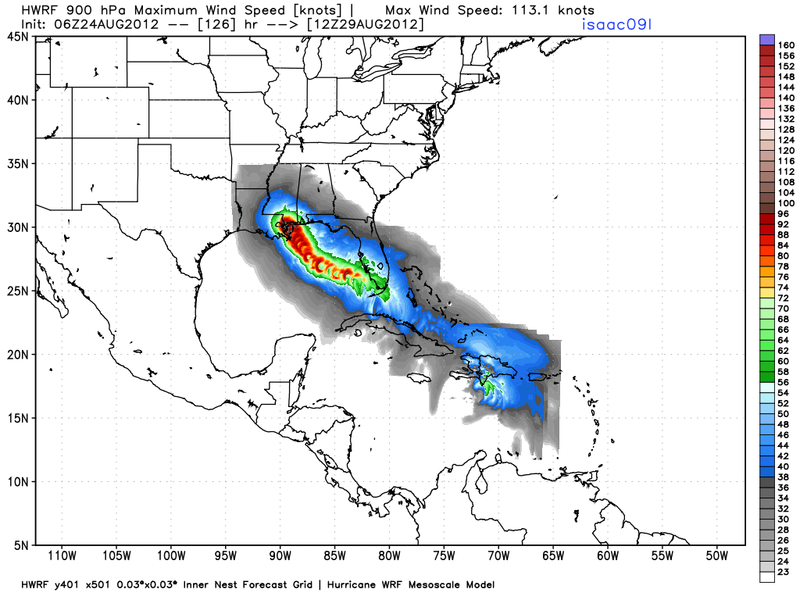 06Z/Midnight HWRF Inner Nest 4-Panel Forecast. 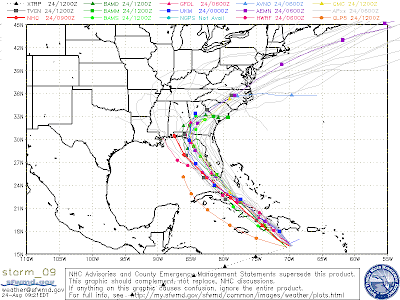 We saw a slight shift westward yesterday in Issac's forecast track with the various computer forecast models. This after a lot of people had been thinking that the European (ECMWF) forecast model was the outliner, and too far west with its forecasts. A great deal of uncertainty still remains concerning the exact track that Tropical Storm Issac is going to take from today into the first of next week. 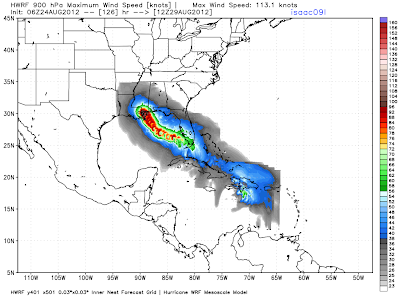 The HWRF forecast model is giving some folks a scare, with its forecast of nearly a direct hit on New Orleans, by around sunrise next Wednesday morning. This is just too close to Hurricane Katrina's landfall and devastating results on August 28-29, 2005. Anyone living along the Texas Gulf Coast eastward to Florida should really be paying attention to Issac this weekend. Should Issac continue to move further west than is currently being forecast, and into the central Gulf of Mexico by the first of next week, he would have a lot of potential to become a strong, if not a very large Major Hurricane, as he moves over the very warm waters of the Gulf. 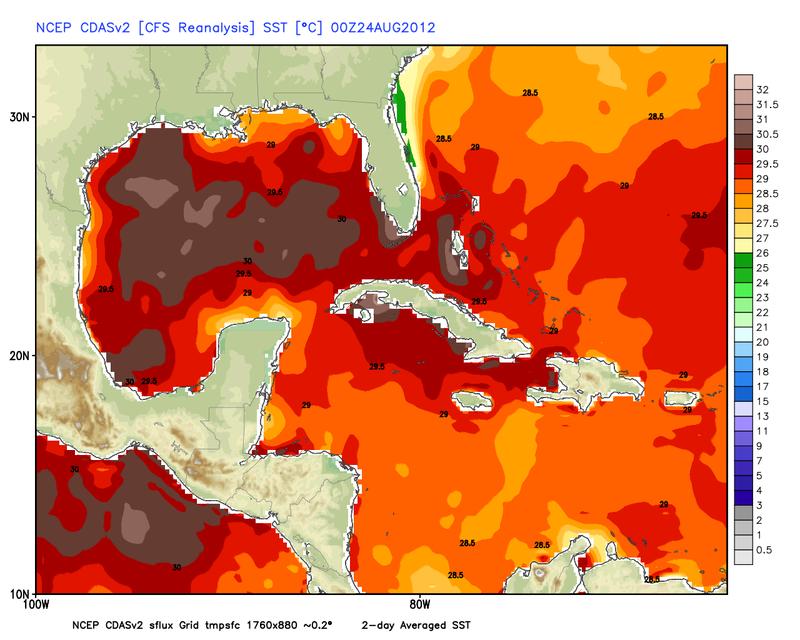 Given that the surface water temperatures in the Gulf of Mexico are as high as the upper 80's to near 90, combined with a very favorable light wind field aloft, we could possibly be looking at a monster of a Hurricane! Should Issac track more to the east, and over Hispaniola and Cuba this weekend, he could re-emerge into the eastern Gulf of Mexico early next week as a weaker storm. 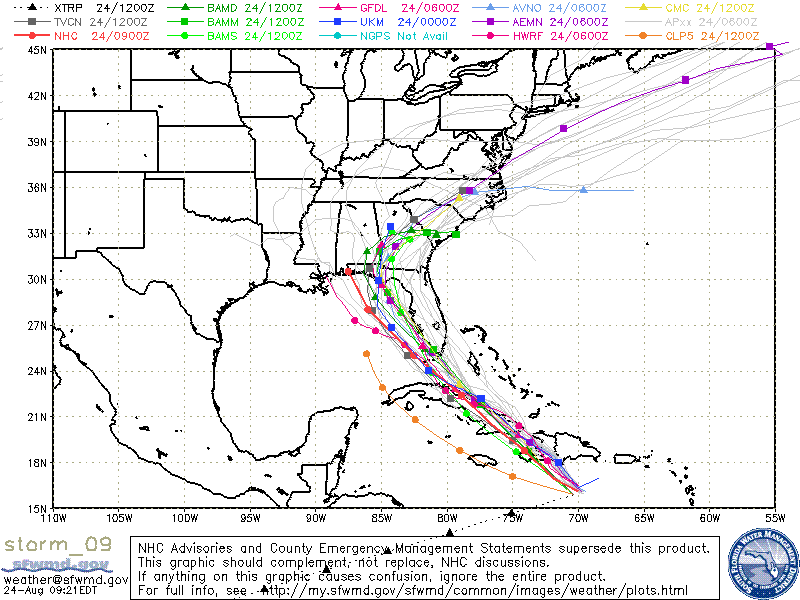 Concerns then would shift back towards Florida and nearby areas. Nothing is written in stone at this time.